I have a blog. Who exactly doesn't these days? I have more than one blog, though, which probably still does not make me special. I have two active blogs on Blogger, one of which I post to several times a month, and one that I post to rather sporadically. 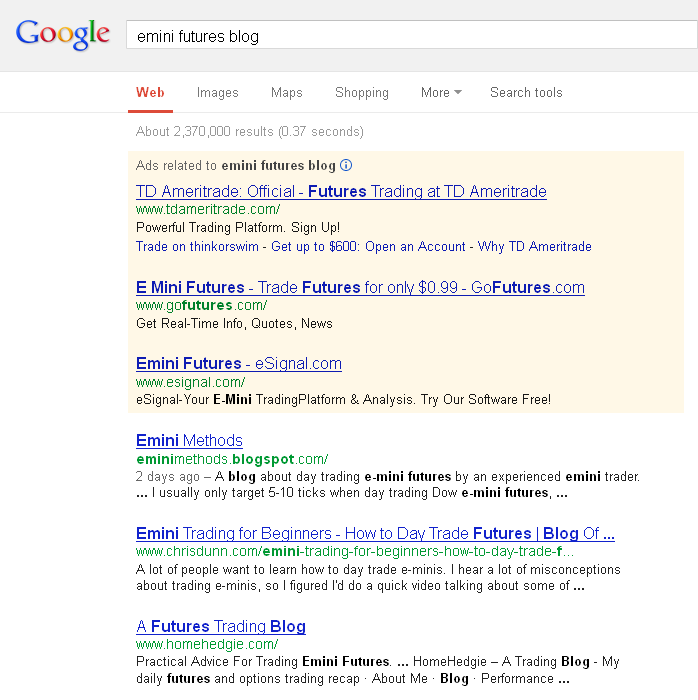 I am talking about blogs primarily dedicated to trading e-mini futures markets. Both of them, though one of them, Emini Methods - Blog mainly about day trading e-mini futures, has a few categories only loosely, at best, related to trading e-minis. This is a pretty popular blog not only because it places high in search engines (top in Google on more than one occasion, also in Bing); it was also mentioned among Top 100 Futures Trading Blogs by commodityhq.com. The other blog, Emini Trading Basics, is, as its name suggests, more specific, but I post to it only very infrequently and that's unlikely to change. I also have two more blogs about trading e-mini futures on some other blog networks, but nothing particularly special gets posted there and not often either. They are out there pretty much for marketing purposes than anything else. I do recommend that you check out my main e-mini trading blog from time to time, as it has become an integral extension of this site, and at times I may post to it more often than I post here.